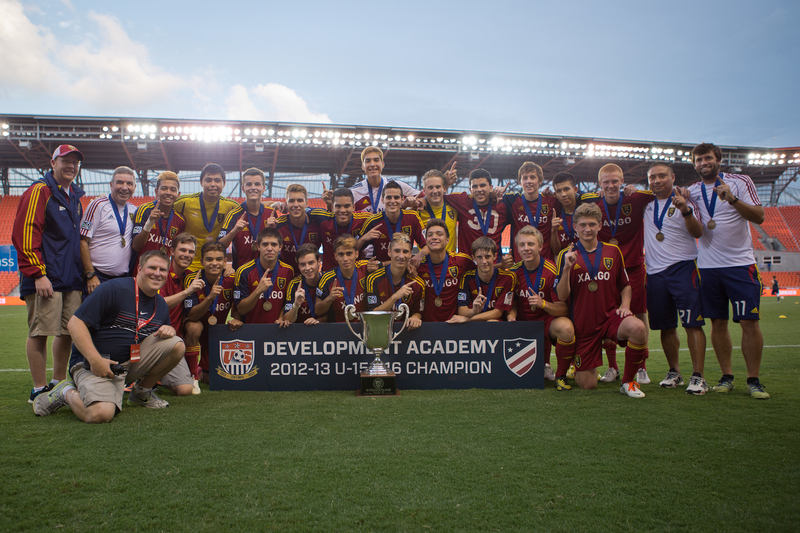 With 17 U.S. Soccer Development products featured, including 13 U.S. Youth National Team players, the 2017 MLS Homegrown Game will certainly make for an exciting 90 minutes to keep your eyes on. If you can't make it to the Windy City's Toyota Park, Tuesday's opening act to the 2017 MLS All Star Game can be seen live at 7 p.m. CT in English on the Univision Deportes Facebook Page and in Spanish on Univision Deportes Network. The 2017 MLS Homegrown Game roster features players from 10 of the 22 MLS clubs, including three players each from Real Salt Lake, New York Red Bulls and FC Dallas. The group will be coached up by former U.S. Men's National Team star Brian McBride and U.S. Youth National standout Mike Magee. Chivas de Guadalajara's U-20 side has a plethora of talent, including five players who have featured for Mexico at past U-17 and U-20 World Cups. 17 of the 18 players on the MLS Homegrown Game roster have registered at least one season in the U.S. Soccer Development Academy. Most recently, at the 2017 Development Academy U-15/16 National Championship game, Atlanta United FC's Andrew Carleton lead the way with two goals for Atlanta to claim a 2-1 victory over 2015 and 2016 Academy Champions, FC Dallas, lead by Jesus Ferreira. Other past champions include Real Salt Lake AZ's Glad, Hernandez and Lennon (2013 U-15/16), FC Dallas' Gonzalez (2012 U-17/18), Ferreira and Pomykal (2016 U-15/16), New York Red Bulls' Louro and Etienne (2013 U-17/18), and Chicago Fire's Mihailovic (2015 U-17/18). Additionally, seven players on the 2017 Homegrown Roster have received Conference Best XI honors while playing in the Academy with their respective clubs: Etienne (East 2013), Ferrerira (Central 2016), Ford (Central 2013), Glad (West 2013, 2014), Hernandez (West 2013, 2014, 2015), Louro (East 2014) and Pomykal (Central 2016). 13 players from the Homegrown Game roster have either been called up to a U.S. Youth National Team camp or have represented the U.S. in international competition: Adams, Carleton, Ferreira, Glad, Goslin, Jamieson IV, Jones, Lennon, Louro, Mihailovic, Palmer-Brown, Pomykal and Trusty. Most recently at the U-20 level, Adams, Glad, Jones, Lennon, Trusty and Captain Erik Palmer-Brown lead the United States to a quarterfinal finish at the FIFA U-20 World Cup in Korea Republic. Lennon found goals against Saudi Arabia and New Zealand while Glad and Trusty notched their own places in the U-20 U.S. YNT record books with a goal each against the All-Whites. At the 2017 CONCACAF U-17 Championship in April, Carleton and Goslin were impact players for the USA, who's runners up finish ensured the team's ticket to India this October for the U-17 World Cup. During group play of the tournament, the USA defeated Mexico for the first time ever in World Cup Qualifying, ending El Tri's 25-match unbeaten streak in CONCACAF U-17 Championship play. Since the MLS Homegrown Game was founded in 2014, the year's best homegrown players throughout the league have had the opportunity to test themselves against stellar domestic and international competition: Portland Timbers U-23s (2014), Club América (2015) and Mexico's U-20 National Team (2016). Four Homegrown players are making their third trips to the MLS's pre-All Star event: Palmer-Brown, Glad, Gonzalez and Jamieson IV, while Adams and Hamilton are returning for a second time. Notable players from past Homegrown Games include U.S. Men's National Team players Jordan Morris, Tommy Thompson, Wil Trapp and Gyasi Zardes.